But the moment belongs to Chelsea as they collect their first major piece of silverware. Oh, and what a way to do it in front of a record attendance for the first Women's FA Cup final to be held at Wembley. This is us signing off on an historic day that English football will never forget. Well, that is just about it from us today. Don't forget to frequent the BBC Sport website and tune in to BBC 5 live Sports Extra and BBC local radio to follow our women's football coverage. Today was all about the Women's FA Cup, but there is the very big matter of Chelsea now going on a serious hunt for a domestic treble with the Women's Super League One title race wide open and the Continental Cup still in its early stages. Notts County go away beaten finalists on a milestone day in the nation's capital, but they will quickly turn attentions to league action as Bristol Academy visit Meadow Lane on Wednesday. "We just made history so we are absolutely buzzing. Holding this for the first time in a Chelsea shirt, I'm really proud to be part of it. "This is the first cup they have won and that is me included in it. "I'm happy for all the girls that are here and who have been part of disappointment, especially last year (when they failed to win the league on the final day)." BBC Sport's Tom Garry at Wembley: "Joy for Chelsea, as their wait for a trophy comes to an end, and on today's performance, they fully deserve it. "Ji So-Yun may have got the winning goal but it was Eniola Aluko who won this match with a superb, individual performance." "They showed strength, resilience and everything you need to be an FA Cup final-winning team. What an occasion. It wasn't a bad match but Chelsea came out on top and deservedly so." "We work hard as coaches for days like today. I could not ask to be part of a better organisation or to have a better staff, they have worked their socks off for three and a half years. "We have a group of players that not only commit to everything we do, but tell you what they were never going to be on the losing team today. I knew that from the opening whistle. I'm incredibly proud of them. "I actually enjoyed every minute of it." BBC Sport's Tom Garry at Wembley: "Now a nine-time FA Cup winner, Katie Chapman makes the iconic walk up the 107 steps to lead Chelsea to where they will collect the trophy. What a moment for the Blues." "The overwhelming emotion right now is just relief. It has been a long time coming. "After coming so close last season (to the WSL 1 title) everyone has talked about it, will Chelsea do it? How will we play under pressure? But we certainly played under pressure. "We were disciplined and got the win. This is history in the making I couldn't be more proud of this group of players." Chelsea captain Katie Chapman told BBC Radio 5 Live: "It was always going to be a hard game and we managed to hang on. Everyone wants to play in an FA Cup final and at Wembley it's a dream come true. We've got a great bunch of players and I'll be happy to lead them up there to lift the trophy." Ji So-Yun, known as Chelsea's 'little magician' writes her place in English football history for the 37th minute winner. It was a bit of a messy finish from a classy player. But they all count. And this one certainly does. 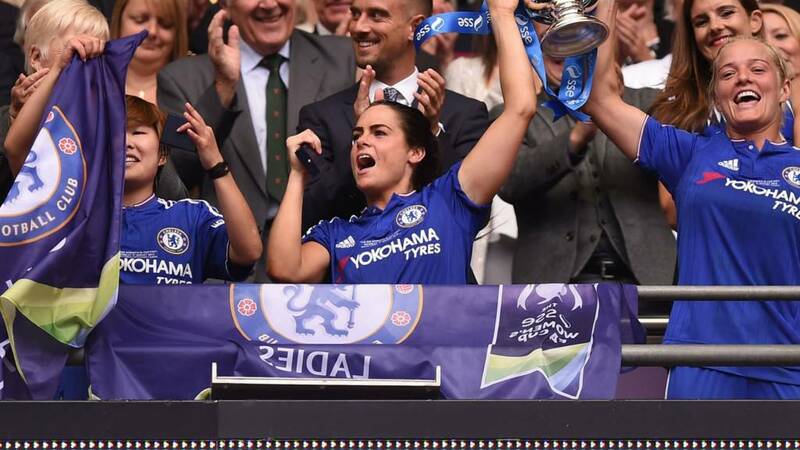 Chelsea Ladies make history, collecting their first piece of silverware in the first Women's FA Cup final to be hosted at Wembley. The Chelsea bench cannot sit still as they will the final whistle to come. We are ticking down the seconds to a Chelsea win in Women's FA Cup final. The nervous buzz fills the stadium as full-time approaches. And three minutes of added time to come. Ji So-Yun puts her hands up to clap the fans as the goalscorer is replaced by Laura Coombs. Has the South Korea international scored the winner today? The noise is beginning to build at Wembley. Chelsea fans urging their side on to victory, while Notts County supporters try to lift their players to find that elusive equaliser. "I thought Notts County might have something up their sleeve but they haven't come to the party today and they haven't managed to get through the Chelsea back line." Chelsea, just minutes away from winning this historic final at Wembley. Notts County are beginning to show some desperation. Route one football it is then. Fiona O'Sullivan is found in the box with a long ball, but she does not get enough on what presented itself as a free header. There is the last roll of the dice by Notts manager Rick Passmoor as he turns to Fiona O'Sullivan to replace Leanne Crichton. That screams 'go for glory' as the Republic of Ireland international knows how to net a goal or two. Emma Hayes makes Chelsea's first change and it is Eniola Aluko who goes off for Ana Borges. Aluko gets applause for her sterling efforts today. Is Hayes looking just to keep fresh legs out there to close this one out now? "Notts have got to stop worrying about the threat that Chelsea carry. They have got to not worry about going 2-0 down but just try and get it back to 1-1." "The attendance is so good for women's football and off the back of the World Cup, crowds and attendances have increased and people want to know about the women's game now." Notts County make their second change as Aileen Whelan comes on for Dani Buet. Can Whelan produce something late? She has form, having scored an injury-time winner for Notts County in their Continental Tyres Cup group win over Birmingham City earlier this month. Chelsea's Gilly Flaherty from five yards puts the ball over the bar and far away! Big chance to go two up has gone begging. And what can a chance in this game be without Eniola Aluko having something to do with it. on Twitter: "@EniAlu is absolutely the stand out player of this match so far by a country mile!! #FAWomensCup"
on Twitter: "@Official_NCLFC just need to find a playmaker linking midfield to the forwards. #WomensFACupFinal"
Eniola Aluko shows that she can do it all, getting back in defence to shepherd the ball over over the line with Notts County's Jess Clarke desperately trying to get in around her England strike partner. BBC Sport's Tom Garry at Wembley: "Notts County will have gained some confidence after having their first two real efforts on goal, but Davison and Aluko once again have reminded them of the danger they can pose at the other end. "You sense that Chelsea could have at least another goal in them." "This is what I want to see. It all went a bit stale after the restart but both teams now look like they have a bit of buzz about them." If there was any questions about Carly Telford's injured shoulder, she is answering them as she gets down neatly to parry an Eniola Aluko shot around the post. "It is more end to end now and there are more challenges. There might have been nerves to start with but Notts have to go for it now. They have to find a goal from somewhere." Eniola Aluko with that wicked turn of pace gets into the area, but Notts County's defence recovers as Gemma Davison shoots well over the bar. From the resulting corner Leanna Crichton has a header cleared off the line by Gemma Davison. Notts County piling the pressure on now. "Rick Passmoor has got an excellent track record on tactical substitutions and maybe Dunia Susi's introduction can shake things up against Chelsea this afternoon." BBC Sport's Tom Garry at Wembley: "Notts County really have to find a way to change this game somehow, and quickly. They're simply not creating enough going forward. Can the introduction of Dunia Susi be their inspiration?" Rick Passmoor goes to his bench looking to make a difference. The versatile Dunia Susi replaces Rachel Williams. It certainly can be viewed as an attacking move, but it is really like for like as Susi is not shy of getting on the score sheet. Amy Turner, who has only recently gone professional with Notts County, shows that she is made out of stern stuff as she holds off Drew Spence as she tries to muscle in on goal. Chelsea are showing great poise in the early minutes of the second-half, back-tracking comfortably in defence and knocking the ball around with confidence. They will make Notts County work as they chase this game. BBC Sport's Tom Garry at Wembley: "The Notts County players had a lengthy huddle there on the pitch before the re-start. They need to find some inspiration in this second half." Alex Greenwood wrestles possession in the middle of the park for Notts County under pressure from Gemma Davison. A pass down the left frees up Ellen White, but the England striker can only get a tame deflected cross into the box. And just as we go on about being suited and booted for the final, Notts County manager Rick Passmoor presents himself in a tracksuit pitch side. I do believe that means it's business time! England and Manchester City defender Lucy Bronze on BBC One: "As the game went on, Chelsea opened space for Eni Aluko and it was always going to be one of the front three who scored. But they are more aware of the attacking threat from Notts County, now." The teams are coming back onto the pitch with Chelsea leading the way. Plenty of intent in the eyes of Eniola Aluko and steely determination from Ji So-Yun. Notts County gather in a huddle. Captain Laura Bassett will deliver what she hopes to he the last powerful words before we get back underway. Rick Passmoor is your tracksuit manager in every sense of the word, hands-on, committed, hard working. He is not a man that is ever lost for words and he will have to be at his loquacious best as Notts County look to turn this around. Already today - and thanks to his mother up in Doncaster - we have seen a different side of Passmoor as he is suited and booted for the final. "So there you go, the suit will be worn. I would prefer to be in the tracksuit on pitch-side but the occasion deserves the suit. "The players deserve everything in terms of what this FA Cup is all about and what we want to ensure for the city of Nottingham, our supporters and in particular Ray Trew (chairman) and Luke Negus-Hill (CEO) who have backed us all the way, is to have a sense of pride of having Notts County Ladies on the hallowed turf. Let's make sure we bring that cup back." Wembley and the glory of FA Cup have inspired children, players, coaches and managers for generations. Chelsea boss Emma Hayes told BBC London 94.9 this week that she dreamed of being Glenn Hoddle leading Tottenham out at Wembley when she was growing up. With the national stadium today hosting its first Women's FA Cup final, just how many youngsters, boys and girls, are going to want to emulate Hayes? Her Chelsea side are up here at half-time. Will see experience Wembley success like Hoddle did before her? on Twitter: Eni Aluko is more effective as a supporting striker with her powerful runs and dribbling skills." on Twitter: "Eni Aluko looks like she was born to play football with that control. Beautiful goal." BBC Sport's Tom Garry at Wembley: "After a slightly tentative start, Chelsea are into their stride now in this final and the star of the show really has been Eniola Aluko. "The England striker was brilliant for a 10-minute spell and that has been the difference between the teams so far. "Notts County need a big half-time team talk from boss Rick Passmoor now." Ji So-Yun's has the honour of netting the first Women's FA Cup goal at Wembley Stadium. Her scrambled finish for Chelsea is all that separates these two sides. Notts County have 45 minutes to try deny Chelsea Ladies their first major piece of silverware and instead take it for themselves. Time and time again Gemma Davison is breaking down the right wing and asking major questions of this Notts County defence. Hannah Blundell swings the ball into the box and Drew Spence tries something a little spectacular with a half-hearted overhead that trickles out of play. "You can ask if it's luck that it lands at your feet or say it's that you're a clever instinctive player. I think it's more the latter." Chelsea captain Katie Chapman is the first to go into the book. Casual as you like, she stopped Dani Buet from getting away. Tactical foul, but not the best timing as she will have to be careful after the break. "It's been all Chelsea this last 10 minutes and no question, the goal was going to come on that left hand side. Notts County need to regroup because they've been on the back foot for the past few minutes." In a flurry of activity, Gemma Davison goes close with a volley from a tight angle. And just as it looked like a major chance had gone begging, Chelsea take the lead through Ji So-Yun, who pokes the ball over the line after initially being stopped by Notts County goalkeeper Carly Telford. The architect of Chelsea's surge into the lead has been Eniola Aluko. Eniola Aluko gets her foot well and truly behind that one. The England striker did well to make space and got plenty of power on the shot, but it was straight at Carly Telford in Notts County's goal. BBC Sport's Tom Garry at Wembley: "That was a brilliant ball forward from Gemma Davison and Eni Aluko almost took full advantage. That's an example of the threat Chelsea pose going forward. "Notts, after a promising start, have gone a little quiet. Can they get England striker Ellen White into the game more?" Hedvig Lindahl strolls out to the edge of her area to meet a clearance from Notts County. That would just about sum up all the Chelsea goalkeeper has had to do so far. The Magpies, while willing to be patient with their build up, are yet to rattle Chelsea's nerves. That will go down as the first real chance of the game. Eniola Aluko's pace is enough to meet a Gemma Davison pass and to get around Notts County goalkeeper Carly Telford. But the ball runs long and is fired into the side netting from a tight angle on the left. Dani Buet has broken free a few times down the middle now for Notts County. She has a good turn of pace and is freeing up players out wide. The midfielder spent eight years with Chelsea, so knows her opposition better than anyone out there. "What I cannot wait to see is what Notts County have up their sleeves in terms of set pieces. I believe they've got one codenamed 'Dave' which I expect to see today." Things are getting physical out there. Gilly Flaherty brought Rachel Williams down and was on hand to clear the danger when the ball was put into the box. At the other end it is Gemma Davison who throws her body into a challenge and gives away the foul. Chelsea are quick on the counter with Eniola Aluko making progress down the left wing. "The first 15 minutes has been a little bit scrappy, and that's nerves. It's a massive occasion and neither team has got into their passing game." Ji So-Yun with her back to goal and just on the edge of the area. That spells real danger for Notts County. But Magpies captain Laura Bassett stays composed and intercepts Ji's audacious little flick attempt on the spin. Gemma Davison lashes the ball into the side netting. When you need someone to be a menace, good chance it is going to be Davison making noise. She scored twice on her league debut for Chelsea this season and that was enough to get the better of Notts on the opening day of the season. on Twitter: "Our Winton Wanderers U11 girls travelled from Salford today to be at the #WomensFACup." From a corner Chelsea don't trouble Notts County, but from deep Claire Rafferty sends the ball high and long. Now in normal circumstances, it would mean nothing but it did call on Carly Telford to come out and collect. Considering goalkeeper Telford is just back from a shoulder injury, testing her fitness is not a bad idea. BBC Sport's Tom Garry at Wembley: "Chelsea haven't really got going yet and Notts County are seeing a fair amount of the ball. "Perhaps there are some nerves among the Blues players. They'll want to get the ball out wide to use the pace of Gemma Davison and Eni Aluko more as this game goes on." Notts County midfielder Leanne Crichton tries to link up with Rachel Williams by slipping a nice ball into the box. However, the Scotland international was a bit overzealous. Chelsea's defence are dealing with everything with ease, but how long will it be before their attacking force comes down on the Magpies? Notts County goalkeeper Carly Telford has got her hands on the ball twice, but Chelsea are not making any threatening inroads. The Magpies have poked and prodded though the middle and searched for spaces down the flanks. They certainly look keen to get to grips with the occasion in a hurry. on Twitter: "Impressed at the turnout! Hoping for a good match and a Notts County win so Laura Bassett gets to lift the trophy." on Twitter: "Chelsea look strong, but I'm rooting for County. Big risk with no back up keeper though." on Twitter: "Women's FA Cup. Live on BBC. Being played (at last) for the first time at Wembley. You just got awesome, Saturday." Ex-England goalkeeper Rachel Brown-Finnis: "If I had to put money on this game, I think it's going to be tight, but I'd have to go with Notts County." England and Arsenal defender Alex Scott: "I think Chelsea will come out winners. They have players such as Eniola Aluko and Ji So-Yun, so they can find that extra edge and score goals." Ex-England and Doncaster forward Sue Smith: "Neither team are in the greatest form at the moment. I'm going to go for Notts County and I think it's going to be 2-1." Chelsea defender Claire Rafferty makes sure that she introduces herself to as many Notts County players as she can. She took down Rachel Williams for the free-kick and just bundled Jess Clarke over for good measure. Notts County getting a good feel for the ball here and Rachel Williams wins a free kick on the left. Danger for Chelsea to defend early on. However, Alex Greenwood puts a little too much on the and no harm done. And we are all systems go at Wembley Stadium as Chelsea kick-off. At the end of today's match there will be a new name on the Women's FA Cup trophy. BBC Sport's Tom Garry at Wembley: "As the teams were read out, the loudest cheer by far was for Laura Bassett." Bassett, you might remember, scored the own goal that resulted in England losing to Japan in the World Cup semi-final. In case you missed it earlier, here's a reminder about how our two finalists line up. Chelsea Ladies: Lindahl; Blundell, Flaherty, Fahey, C Rafferty; Chapman (c), Bright, Spence; Davison, Ji So-Yun, Aluko. Substitutes: Hourihan, Borges, Coombs, Brett, Banusic. Everyone stands for the national anthem. The look of real concentration and determination on the faces of all the players as the TV camera pans across both teams. Laura Bassett leads Notts County out onto the Wembley Stadium pitch and Katie Chapman wears the captain's arm-band for Chelsea. They stand in a line. What an historic moment this is as they get red carpet treatment onto the most hallowed of English football turf. England striker Eniola Aluko knows what it takes to win an FA Cup final, having picked up the famous bit of silverware with Charlton and Birmingham City. biggest day in their history. After scoring the own goal that ended England's hopes of winning the Women's World Cup, she said she would "prefer no-one to know my name". But she is back on centre stage and admits that being the first woman to lift the FA Cup trophy at Wembley would be a seminal moment in the women's game. Her team-mates might say otherwise, with goalkeeper Carly Telford wanting to bring "gold" back for Bass. Oh, and if the weekend was not already big enough, Bassett celebrates her 32nd birthday on Sunday. Twin sisters Isobella and Sofia with father Steve. Favourite player they say is Eniola Aluko and they pick Chelsea to win 3-1 after quickly changing their minds from 100-0. BBC Sport's Tom Garry at Wembley: "Aside from the historic nature of this first Wembley final, this a massive day for both these clubs, both of whom have never won a major trophy before. "Arguably, there is more pressure on Chelsea, especially considering how close they were to winning the league title last season. "Emma Hayes' side are absolutely desperate for silverware, and with the calibre of their squad, they are expected to start delivering soon." As well as following our live text coverage this afternoon, you can also watch the game unfold here by clicking on the live coverage tab or on BBC One. The television coverage, presented by Jacqui Oatley, is starting right now. You can also listen to the game on BBC Radio 5 live, BBC Radio Nottingham, BBC London 94.9 and BBC World Service. England striker Ellen White has scored for Notts County in every round of the Women's FA Cup on the way to Wembley. Her effort against Tottenham in the fifth round was particularly special as it marked her return after an 11-month injury lay-off. From there, White quickly rejoined the England ranks and was part of the Lionesses bronze-medal-winning side. Now that is how you do a comeback. "For Chelsea, I think Ji So-Yun. I just think she's class, she's a great player. "If you give her time and space on the ball she's going to make something happen, she's so dangerous going forward." Notts County and England defender Alex Greenwood made it to this stage last season, losing to Arsenal with an Everton side that was eventually relegated from the top flight. The 21-year-old does not recall the experience fondly and it has certainly added fuel to an already emotion-charged occasion. Greenwood told BBC Sport: "It was devastating. I don't think I turned up to the game. For me personally, it is probably one the of the worst games that I've played. "As a team I don't think we were ready for an FA Cup final, in the WSL we were struggling and hadn't won a game. Ultimately that shattered Everton and that sent us down. Confidence-wise, it knocked a lot of players. "That is a memory and something I look back on and it motivates me. It makes me a better player. Even though it was a bad time and hard time it has made me better for the future." Greenwood's first meeting with Everton since her move was the Women's FA Cup semi-final, where she got to play at Goodison Park for the first time. School run... Check. World Cup bronze, eight Women's FA Cup winners medals... check... History maker at Wembley... check. BBC Sport's Tom Garry at Wembley: The England fans band are at Wembley for the #WomensFACup final. Today's winners will be collecting the Women's FA Cup for the very first time. BBC Radio Solent and Tom Garry took a trip down memory lane with the side that reached 10 of the first 11 Women's FA Cup finals. And if they were not already engrained enough in the fabric of this competition, they recorded the biggest win in the final - 8-2 over QPR at Slough Town in 1978.
a bit of a treasure hunt going on there. Let's rewind the clock to the very early stages of the competition. Going all the way back to 7 September, we had the biggest win in this season's competition. And it was Nettleham that got the better of 13-0 Arnold Town in the preliminary round. We will be coming at you with a nice selection of random Women's FA Cup facts today. Chelsea Ladies started their campaign with a thumping 6-0 win over WSL 2 side Watford in front of just 264 fans at Staines Town. Next up they knocked defending champions and 13-time winners Arsenal out at the quarter-final stage. A 1-0 home win against Manchester City earned them a spot in their second Women's FA Cup decider. Notts County really have eased through to this year's Women's FA Cup final, bagging 12 goals against three sides from outside the top flight. Chelsea are the first Women's Super League One outfit that the Lady Magpies face, having got past third-tier side Tottenham 4-0 in the fifth round before thumping WSL 2 outfit Aston Villa 5-1 in the quarter-finals. They earned a trip to Goodison Park for the last four where they were comfortable 3-0 winners against Everton - the side that had denied them a spot in the decider a year earlier. No surprise in Chelsea's line-up for this final as boss Emma Hayes sticks with the same starting XI and bench from their 2-1 home loss to Manchester City in the league six days ago. Chelsea lost that one late on and definitely grew throughout the match. It was their first home defeat since September 2013 and second loss on the spin in the league, but certainly there was no reason to change the world for this game. The first of this afternoon's team news is in. Carly Telford starts and is Notts County's only eligible goalkeeper for the Magpies today. The England keeper says she is "fit and ready" after returning from a dislocated shoulder, but Notts have had outfield players practicing in goal this week. If the worst does happen and Telford does hurt herself again then maybe we will see Rachel Williams take on the gloves. Yep, she would certainly love to play the hero by all accounts. Kick-off is just over 45 minutes away. Nervous Notts and Chelsea fans? Or are you new to women's football off the back of the World Cup? Wherever and however you're following this afternoon's final we would love to hear from you. Join in by using #bbcfootball on Twitter. BBC Sport's Tom Garry at Wembley: "'Wembley Way' might differ significantly from the approach to Women's Super League grounds, but the atmosphere here remains the same, with absolutely no hostility. Thousands of families are enjoying a day out. "It has to be said that, as well as Notts and Chelsea fans, there are many fans here of other clubs too, proudly wearing their shirts, including some Arsenal, Barcelona and Doncaster Rovers Belles supporters. "28,500 tickets were sold before the day, and with tickets still on sale this afternoon, the Football Association are hoping to break the 30,000 mark." "It's massive and it just shows how far women's football is evolving in this country, especially off the back of such a successful World Cup. "I think the women's game needed something like this to come around so quickly to keep the fans onside." Welcome and thanks for joining us for this milestone day as eyes turn to Wembley for the first time for the Women's FA Cup. Wherever you are, sat on the couch at home, on a picnic in the park, or sat up in the famous national stadium, we will brining you updates as they happen here. As well as live text, video and audio on the BBC website you can tune in to BBC One to watch the live telecast or listen in to BBC Radio 5 live, BBC Radio Nottingham, BBC London 94.9 or BBC World Service. In any and every way, we have you covered. Enjoy it, because it is bound to be an enthralling occasion. After 44 years, the Women's FA Cup arrives at the home of English football - Wembley. A new name will be engraved on the trophy with Chelsea and Notts County chasing their first major piece of silverware. Today a record crowd will descend on the national stadium for a game for the history books. Who will write a tale of glory and who will turn the page on despair?